PHOENIX, Ariz., (November 1, 2016) - Air Services Int’l., LLC (ASI), an FAA approved Part 145 repair station specializing in Rolls-Royce Model 250 engines and Bell Helicopter component MRO services, announced today that it is relocating to a newly constructed 20,040 ft.² facility near the Deer Valley Airport in Phoenix, Arizona. The relocation is currently in process and will be completed in early November. ASI’s newly constructed 20,040 ft.² facility is located on a 1.16-acre site at the Turner Spectrum Ridge development. Inside the building is 1,500 square feet of finished office space. Outside of the building is an additional 16,108 square feet of secured yard space. The new facility provides ASI with the added space it immediately needs for current operations. The new facility also provides the space needed for expansion as ASI develops capabilities for additional powerplant families including the Honeywell T53 / T55 series and Pratt & Whitney PT6 series. ASI is also considering expansion into General Electric platforms. 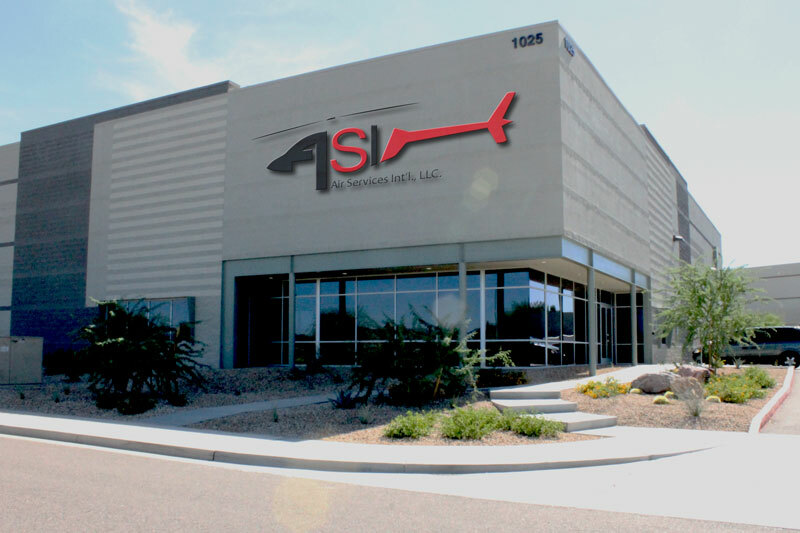 ASI’s 66 year history started when it was established in 1948 at the Chandler Airport. In 1967 ASI relocated to the Scottsdale Airport where it operated for many years. ASI relocated again to the Deer Valley area in 2006 and has chosen to remain in the Deer Valley district, one of the fastest developing markets in the Greater Phoenix Metropolitan area. The Deer Valley district is the home to more Fortune 500 businesses than any other district in the Phoenix metro area. According to the City of Phoenix Employment Center, the Deer Valley area has an estimated 380,000 workers living within a 20 minute commute and more than 770,000 workers live within a 30 minute commute. The accessibility of skilled employees is important to ASI as it continues to grow. The new facility is located less than two miles from the Deer Valley Airport, the #1 ranked general aviation U.S. airport according to the General Aviation Manufacturers Association’s 2013 General Aviation Statistical Databook (page 42). The newly constructed facility provides ASI with significant advantages. The shop floor has been optimized for efficiency, every ASI technician has a dedicated computer workstation with flat panel monitor, allowing them access to the latest technical data. New non-destructive testing and paint shops are in place. Increased storage and warehousing space for engines, modules, components, spares, and consumables all enabling ASI to retain more items on site. This past twelve months has been an active time for ASI. Company representatives have been meeting operators in the field and exhibiting at trade shows including overseas shows like the Singapore Air Show and FIDAE. ASI also exhibited for the first time at MRO Americas this April. ASI continues to expand its talent pool, recruiting technicians and other staff. With the new facility, ASI has the space it needs to support additional technicians and is continuing its recruiting programs to expanding its overall workforce. ASI is committed to providing continued customer support throughout the relocation to the new facility. The transition is expected to occur with a minimum of disruption to work and customer requirements. Established in 1948, Air Services Int’l., LLC (ASI) provides global support to commercial, military and parapublic helicopter operators. Specializing in supporting Rolls-Royce (Allison) Model 250 series gas turbine engines, ASI provides: maintenance, repair and overhaul (MRO), functional and performance testing, and engine leasing services. ASI also supports component repair and overhauls for Bell light and medium helicopters, STC engine upgrades for Bell 206-L1, parts sales, exchanges, consignments and supply chain management. Air Services aims to provide 24/7 global powerplant and rotor-wing support.